For the central city of the Kansas City Metropolitan Area, see Kansas City, Missouri. In March 1886, "new" Kansas City, Kansas, was formed through the consolidation of five municipalities: "old" Kansas City, Armstrong, Armourdale, Riverview, Wyandotte. The oldest city of the group was Wyandotte, which was formed in 1857 by Wyandot Native Americans and Methodist missionaries. In the 1890s, the city saw an explosive growth in population as a streetcar suburb of Kansas City, Missouri, from which it takes its name; this growth continued until the 1930s. It was one of the nation's 100 largest cities for many U.S. Census counts, from 1890 to 1960, including 1920, when it had a population of over 100,000 residents for the first time. Pomeroy − a late 19th century-early 20th century Train Depot, Trading Post, Saw Mill, and river landing for barges to load and unload. Kansas City lies in the Midwestern United States, as well as near the geographic center of the country, at the confluence of the longest river in the country, the Missouri River, and the Kansas River (also known as the Kaw River). The city lies in the Humid continental climate (Köppen Dfa) zone, with four distinct seasons, and moderate precipitation, and is part of USDA plant hardiness zones 5b and 6a Being located in the center of North America, far removed from a significant body of water, there is significant potential for extremes of hot and cold swings in temperature throughout the year. Unless otherwise stated, normal figures below are based on data from 1981 to 2010 at Downtown Airport. The warmest month of the year is July, with a 24-hour average temperature of 81.0 °F (27.2 °C). The summer months are hot, but can get very hot and moderately humid, with moist air riding up from the Gulf of Mexico. High temperatures surpass 100 °F (38 °C) on 5.6 days of the year, Precipitation, both in frequency and total accumulation, shows a marked uptick in late spring and summer. 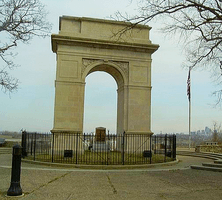 Rosedale arch, a replica of the Arc de Triomphe, at the top of memorial drive (). Wyandotte High School is a notable public school building located at 2501 Minnesota Avenue. Built in 1936 as a Works Progress Administration project, the school was later designated as a Historical Landmark by the city in 1985 and placed on the National Register of Historic Places on April 30, 1986. In 1889, the Wyandotte County Museum and Historical Society was established as a permanent repository of the county's history. The Argentine Carnegie Library, the only Carnegie library that exists in the metropolitan area, was built in 1917. Kansas City, Kansas is served by the The Kansan, a daily newspaper which ceased its print publication and became an online-only paper in 2009. Newspapers serving the city's suburbs include The Record (serving Turner, Argentine and Rosedale), Piper Press (serving Piper) and The Wyandotte West (weekly publication for western Wyandotte County). The major U.S. broadcast television networks have affiliates in the Kansas City market; including WDAF-TV 4 (Fox), KCTV 5 (CBS), KMBC-TV 9 (ABC), KCPT 19 (PBS), KCWE 29 (The CW), KSHB-TV 41 (NBC) and KSMO-TV 62 (MyNetworkTV). Other television stations in the market include Saint Joseph, Missouri-based KTAJ-TV 16 (TBN), KCKS-LD 25, Lawrence, Kansas-based KMCI-TV 38 (independent), Spanish-language station KUKC-LP 48 (Univision), and KPXE-TV 50 (Ion Television). Kansas City, Kansas Facts for Kids. Kiddle Encyclopedia.